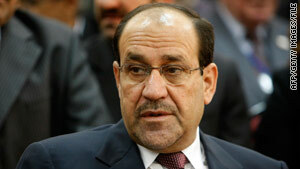 Iraqi Prime Minister Nuri al-Maliki has told The Los Angeles Times that he was unaware of any abuse at the prison. Baghdad, Iraq (CNN) -- Iraqi Prime Minister Nuri al-Maliki has disputed reports that accuse Iraq of torturing and abusing people in a secret prison. "There are no secret prisons in Iraq at all,"Al-Maliki said in a Monday interview with state-run Al-Iraqiya TV. Allegations of torture and abuse at the prison, named Muthanna, were first reported by The Los Angeles Times April 19. Amnesty International has urged Iraqi officials to investigate the claims. Human Rights Watch released a report on the issue Tuesday, saying the detainees are routinely beaten, shocked and sodomized by their interrogators. Al-Maliki continued to deny that there was a secret prison and called the reports "a smear campaign in which embassies and media organizations took part and it was perpetuated by Iraqi politicians because it serves their interests to say that there are secret prisons." The prime minister said the Muthanna facility was not secret, it was publicly known and had seven judges working there. He said there are a small number of cases of abuse in jails but he said that happens in all parts of the world. Al-Maliki said he knows that some members of parliament visited the facility and directed the inmates to make false accusations about torture and give themselves scars. The report by Human Rights Watch was based on interviews conducted with 42 prisoners who had been held at a secret facility in west Baghdad's old Muthanna airport since late 2009. The men were among 300 detainees who were transferred in recent weeks to another detention center after the existence of the Muthanna prison was revealed, Human Rights Watch said. Detainees interviewed by the human rights group this week said that while at the facility, they were handcuffed, blindfolded and hung upside down using two bars, one placed behind their calves and the other against their shins. They said they were then kicked and beaten with heavy cables by their interrogators, who also are said to have placed plastic bags over detainees' heads to cut off their air supply. Detainees also described multiple incidents of alleged sexual abuse, the group said.